The dawn of April 15, 1887 witnessed a rare moment in the history of publishing in Kerela when Deepika, (Nazrani Deepika- as it was initially named) India's first Malayalam Newspaper was first published. A marvel at that time, it was the realization and fulfillment of a long-cherished dream of many, which its Founder Editor Fr. Emmanuel Nidhiry (Nidhirikal Mani Kathanar), a renowned priest and perceptive, creative thinker of those times, initiated and shaped. The newspaper was initially printed on a crude, hand-made wooden press built by the legendary and far-sighted visionary Carmelite monk, Fr. Kuriakose Elias Chavara (now Saint Chavara) at Mannanam; a remote hamlet near the town of Kottayam in Central Kerela over a quarter century before then. This event further marked the epoch-making but humble dawn of organized, elite, free press journalism in Kerela. The Carmelites of Mary Immaculate (CMI) congregation managed the newspaper till 1989, when it was converted into a Limited Company with public participation named Rashtra Deepika Ltd.; with a view to giving it fresh impetus, added professionalism and new ethos. The newspaper's founders had high and noble ambitions for this unique project that served as a major milestone in the evolution and advancement of literacy in Kerela. Under the dynamic leadership of Fr. Emmanuel Nidhiri, (a versatile genius and renowned philosopher of those times) and his team of thinkers, Nazrani Deepika marched unflinchingly over the years into the 20th Century, growing in stature and spreading its wings further. The printing frequency gradually increased from weekly to twice a week and later thrice a week. Correspondents and contributors were from virtually all segments of society. To represent the needs of the common man to the rulers. To protect and safeguard the inalienable rights of the people. To fight for Truth, Justice and Freedom and to unite the separated brethren of Kerela. On August 1, 1939, the newspaper shifted to Kottayam, which has since become a nerve center for printing and publishing in the state. To give it a more secular outlook, its name was also then changed to Deepika. Over the years, Deepika has continued to make a strong impact on the masses, becoming the voice of the voiceless, staunchly standing out for truth, justice, freedom and equality for all. It is today a credible, authentic, secular and dignified newspaper committed to genuine social, cultural and ethical values. It is a mouthpiece of the oppressed, a source of inspiration for many and has carved out a distinctive personality for itself in the world of newspapers in Kerala; bravely and boldly leading by example from the front. In 1986, Deepika's year-long centenary celebrations were inaugurated by Pope John Paul II and the newspaper commemorated its 100th year of publication in April 1987. Well over the past 130 years, Deepika has grown in strength and stature, standing out boldly for the people, fearing and favoring none. It has relentlessly fought for the well being of farmers, the weaker sections and the rights of the minorities, irrespective of caste or creed. It has also maintained a neutral political stand, earning the appreciation of politicians and leaders, both national and regional, which has helped it earn added credibility and respect. In August 1989, Deepika was converted into a Public Limited Company, Rashtra Deepika Ltd. This was to facilitate the organization to gain corporate dimensions, stimulation and new ethos so as to enable it to meet the myriad challenges of the ever growing and highly competitive world. The event has been the turning point in the history of the organization, which has grown leaps and bounds,ever since. Rashtra Deepika publications have the distinction of being widely read by the affluent, educated and influential class of Kerela society, mostly middle and upper middle class Christian families, who form the bulk of its readership. Many of our readers have distinguished and established themselves at the summit of diverse fields of economic, political and social activities. Top engineers, doctors, bankers, jewelers, share brokers, industrialists, businessmen, agriculturists, etc. are regular readers. Our readers are also receptive as well as widely considered market creators and market movers. The affluent strata, middle and higher-educated class of the Kerala society form the bulk of the Deepika readership. Many of its readers have distinguished and established themselves at the summit of virtually all fields of economic, social and political activities. Top educationalists, bankers, jewellers and gold merchants, planters, share brokers, industrialists, etc. of the state are its regular readers. This is the Company's flagship publication and has been a trendsetter among newspapers of the State, pioneering innovation and new technology. It has ever stood out for equality, truth, justice and human rights in society as well as persistently fought for obtaining fair prices for agricultural commodities - the backbone of our economy as well as encouraged the use of high-yielding crop varieties and scientific fertilizers. Deepika has always supported the poor, the downtrodden and the oppressed, both through its columns and in diverse other ways. The establishment of the Deepika Educational and Charitable Trust' and the 'Helping the Helpless' scheme are examples of recent projects in this regard, which has enabled countless readers to reach out and directly or indirectly support thousands of deserving people through the newspaper. Pope John Paul II inaugurated Deepika's year- long centenary celebrations in 1986 during his maiden visit to India. In 1987, late Indian Prime Minister, Rajiv Gandhi was the chief guest at the centenary concluding ceremony. Deepika, now into its 130th year of publication, persistently strives to achieve its primary noble goals, overcoming hurdles in a fast- moving and challenging world. Its talented editors continue to win laurels and awards, both National and International, for outstanding features published, year after year. Perhaps no other newspaper in India has won so many awards for creative writing and other related subjects over the years, in recent times. 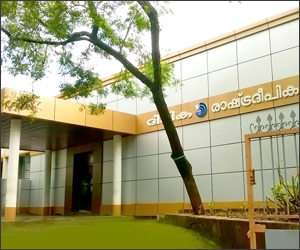 Rashtra Deepika Eveninger was launched in April 1992 as Kerala's first organized and professionally edited Eveninger in the State and that too, coming from an established and reputed Daily newspaper group. It is today the largest selling newspaper of its kind in Southern India with 9 editions and a readership of over a million, every afternoon. It provides the latest and the best of news in an attractive and handy format. Businessmen, traders and the traveling public alike, throughout the State, eagerly read and appreciate its variety contents. On exclusive occasions, when circumstances call for, additional editions are printed to keep the public informed of the most up-to-date information on exceptional issues. More editions are in the offing in the days ahead. RD Eveninger is printed from Kottayam, Kochi, Thrissur, Palakkad, Mallappuram, Kozhikode, Kannur, Kollam and Thiruvananthapuram. Business Deepika is a prominent economic, financial and commercial Malayalam magazine, published since November 1992 and launched by India's then President, Dr. Shankar Dayal Sharma. Now converted into a fortnightly,it provides informative and qualitative news of corporate Kerela and India, covering a wide range of related issues. Karshakan, the popular agricultural monthly was launched in March 1993. Catering to the needs of agricultural Kerela, it appeals effectively to agriculturists, both big and small, from big time plantation owners to the downto-earth farmer. The magazine provides informative guidelines on choices of crops, farming methods, fertilizer application, pesticides, etc. It is in many ways a seasonal handbook for farmers, enabling them to apply correct farming methods and reap higher yields. It also proves to be an ideal magazine for strategists who wish to wish to reach out effectively to the environs of both rural and urban Kerela, where farming is a way of life. Sthree Dhanam was launched in July 1994 as a women's and family magazine. Over the years, it has evolved into a periodical of stature and popularity in Kerala. Its myriad contents are widely appreciated and alluring to readers, particularly women; young and old, traditional and modern. The magazine encompasses their tastes, fancies and preferences in an elegant and appealing manner. 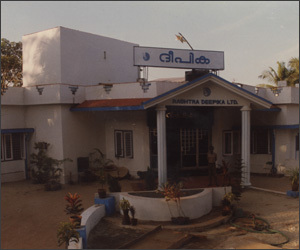 Rashtra Deepika Cinema, launched in September 1995, has been a success from day one. Attractive, appealing and aesthetically designed, it is an appealing and popular film fortnightly. It provides the latest and the best of the glitter and glamour of Kerela's cinema world as well as gives due importance to Bollywood and Hollywood. Avoiding cheap gossip, its articles are appreciated for their authenticity by even the bigwigs of the industry and its opinions have been known to influence the success of many films. 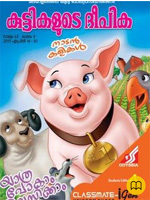 Kuttikalude Deepika was launched as the first Malayalam monthly for children in 1952 with a view to publishing a worthy magazine for the new generation. It is now a popular fortnightly. Children all over eagerly read it and enjoy its assorted contents, which include stories, puzzles and features of all kinds. Children's Digest, an English monthly for the young and the young at heart, was launched in January 1997. It has been a winner from its very first issue and is today second to none in quality and content. Highly popular and cherished all over India and abroad, the Digest has an array of interesting, amusing, educative and mind-testing features that make it the largest selling magazine in its class. Youngsters and elders alike enjoy the magazine and enthusiastically look forward to reading it, month after month. www.deepika.com made history in October 1997 by becoming the first Malayalam Daily on the World Wide Web. 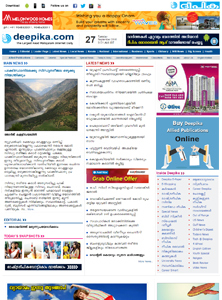 Receiving over three million hits per day and combined with its unique features including easy accessibility, personalized websites .Our Internet edition is today the largest read online Malayalam Daily reaching 125 countries. www.deepikaglobal.com , the English edition is one of the premier Internet English editions in South India. 'Helping the Helpless' the online charity fund promoted by deepika.com, continues to receive tremendous response and to-date, under its auspices, over five million rupees has been given to the needy and deserving in society, on behalf of well-wishers and philanthropists from all over the world. 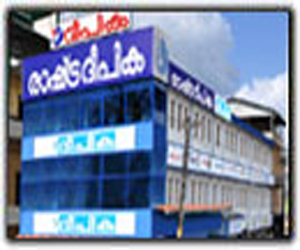 The company has in recent years brought out several special publications in the better interests of readers including Business Directories, Health Directories, Annual Agricultural Directories & Higher Studies Directories, The Indian Christian Directory 2000 & 2006 editions, 'Jeevitha Vijayam', a book on inspirational thoughts for better living, and more recently 'Kerala Vignana Deepika' a compendium on Kerala on the 50th anniversary of its formation, 'Exotic Eastern Paradise' a book on tourism in Kerala, 'Bon Voyage' a handbook for overseas employment seekers and several other value added publications. The Deepika Children's League was set up in 1952 as an extension of Deepika's commitment to society. The aim has been primarily to train school children, irrespective of caste or creed and imbibe in them noble virtues and principles to enable them to become responsible citizens and confidently face the emerging challenges of the developing world. DCL has since its inception enrolled and trained over 6 lakh youth, of whom many are today successfully placed in various walks of life. DCL organizes diverse, training and leadership camps, competitions and workshops, wherein children are provided opportunities designed to help them achieve a positive sense of self, sense of community, and stronger success skills. It also publishes better living books and conducts scholarship examinations. 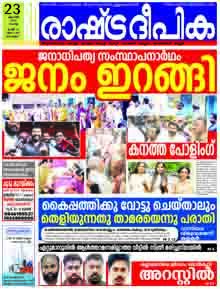 Deepika Daily is printed from our Kottayam, Kochi, Thrissur, Kozhikode, Kannur and Thiruvananthapuram units. We have our own presses and premises at Kottayam,Thrissur and Kannur whereas we use rented presses for printing at other Units. Kottayam Unit covers Kottayam, Idukki, Alappuzha and Pathanamthitta districts. Trivandrum unit covers Trivandrum and Kollam Districts. Thrissur unit covers Thrissur and Palakkad. Kozhikode unit covers Kozhikode, Malappuram and Wayanad. Kannur unit covers Kannur, Kasaragod, Bangalore and Mangalore. In an increasingly aggressive and dynamic market, Rashtra Deepika Ltd. has significantly enhanced its reader base, advertisement revenue and popularity of its publications. Professional Directors with considerable business experience have joined the organization, giving it added vitality and vivacity. The company also has some of the finest journalistic talent in Kerela, many of who have won laurels; regional, national and international. The Internet edition, with value- added features and several million hits daily, habitually makes waves and is a major source of news and information for Keralites the world over. Added to this, the unstinted support of its readers together with the invaluable support and confidence reposed by shareholders has helped the organization grow in strength and stature over the years. Equipped with all these, Rashtra Deepika Ltd. gallantly marches on in the twenty first century, continually setting landmarks and milestones in its relentless pursuit for excellence. The newspaper revolution in India started in the late 18th Century, The first major newspaper in India The Bengal Gazette was started in 1780. Other newspapers such as The India Gazette, The Calcutta Gazette, The Madras Courier (1785), The Bombay Herald (1789) etc. soon followed. These newspapers carried news of the areas under the British rule. The Times of India was founded in 1838 as The Bombay Times and Journal of Commerce by Bennett Coleman and Company, a colonial enterprise now owned by an Indian conglomerate. India, consuming over 100 million newspaper copies in 2008 is the second largest market in the world for newspapers, after China. The main national newspapers of India include the Times of India, The Indian Express, The Hindu, The Hindustan Times, The Ananda Bazaar Patrika etc. In Kerala, Deepika was started as the first Malayalam Daily in 1887 followed by the Malayala Manorama in 1888. Other prominent Malayalam newspapers include Mathrubhoomi, Kerala Kaumudi, Deshabhimani and Mangalam. Deepika also pledges to remain standing out as a voice of the voiceless; perpetuating truth, justice, freedom and equality. It always aims at being a credible, authentic, secular and dignified newspaper, committed to genuine social, cultural and ethical values. It further serves as a mouthpiece of the oppressed, a source of inspiration for many and has carved out a distinctive personality for itself in the world of newspapers; leading by example from the front. Our reader comes first. We commit ourselves to their service and will ensure their satisfaction in every service we offer. We will stand by the people for social justice and security by providing accurate and objective information on time. We will also strive to influence public opinion for positive social change. Our employees are our assets. We will ensure transparent and professional work environment and constantly assist our people to grow along with the Company. We cherish the contribution of our business associates in the value addition of our products and services. We will treat them as partners in our continuous effort for quality improvement. We recognize the plurality of our society and our role in it. We will promote and undertake social and cultural activities that will educate, enrich, and synergize the society we leave in and bring people closer. We appreciate the confidence our shareholders have in us. We commit ourselves to protect their interests in the Company and will strive to increase shareholder value in both monetary and prestige terms. We will ensure, as a team, quality and consistency in every task we undertake. Also we will always conduct ourselves in a manner that befits the dignity and image of our organization. Best Service to all our readers and customers. Respect for ourselves, our colleagues, our company, our products and our customers. 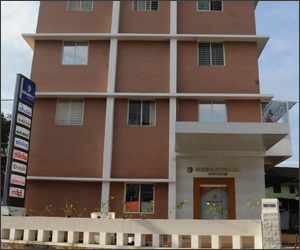 The newspaper and company was taken over by and is under the direct management of the Kerala Catholic Church as of January 2008. Since then, its circulation has more than tripled and its advertisement revenue also increased substantially. Special value added publications have been brought out in recent years such as The Indian Christian Directory, Exotic Eastern Paradise, Higher Studies and Nursing Directories, Exclusive volumes on Blessed Chavara and St. Alphonsa etc. The quality and content of Deepika Daily and its seven allied publications have also significantly been improved. More qualified and experienced personnel have joined various departments. Several professionally qualified and eminent persons have also joined the management team as Directors to further strengthen its base. Deepika is a newspaper with valued principles and ethics but a predominantly regional newspaper. It would be ranked as the third largest in Kerala in terms of sales volumes, preceded by Malayala Manorama and Mathrubhoomi. It hopes to improve its position to the second position in an organized and systematically planned manner over the next few years. The Rashtra Deepika Ltd. Group has many well qualified personnel working at its various printing units and offices all over Kerala and India in different capacities. Matters related to personnel are handled by the Human Resources Department at the company's Head office in Kottayam. Being read by an educated class of people. Being read by people with ample purchasing power. Being read by people who belong to the noble Christian and Catholic communities. Being read by people who are considered market movers and market makers and more open to new products and processes. Being read by those who prefer quality and brand name to quantity or price. 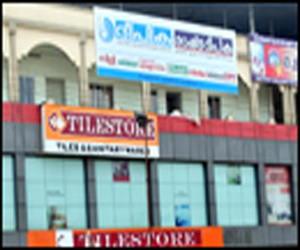 Being a newspaper with remarkable influence in several core commercial towns and districts of Kerala. These and other such factors give it a competitive edge and enhanced strength over other newspapers as well as enable it to receive more advertisements. The company is mulling the revamping of its Daily and other publications in a phased manner. More improved output quality, professional coverage of news, starting of new editions, effectively and economically developing its infrastructure, publications quality, news sources, personnel output etc. are being planned. Improved business promotion techniques and strategies are on the anvil. Ways of facilitating faster productivity and reducing production costs as well as other overheads are being planned. The company further aims to enhance its readership portfolio and become an even more forward looking, progressive, popular and profitable newspaper in the days ahead, living up to the myriad expectations of its discerning readers.